When the 49ers began the year, their backfield was highlighted by two backs who used to tear it up in Statesboro. Jerick McKinnon and Matt Breida, both Georgia Southern products, entered the year as a two-headed monster. Unfortunately, McKinnon’s season was cut short by an ACL tear in practice. 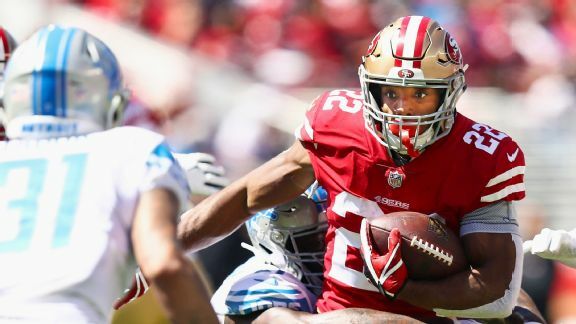 Matt Breida’s 184 yards are good for the NFL lead through Week 2, as are his 8.4 yards per carry (min. 20 attempts). His success will come as no surprise to Georgia Southern fans. Known lovingly as “Mr.He Gone” in Statesboro, Breida blew up his sophomore and junior year with a combined 3,094 yards and 34 touchdowns on the ground. The NFL's leading rusher thru two weeks is @MattBreida. He's gone! @MattBreida goes 67 yards to the HOUSE!